Moms are the primary decision makers of the household, with over $2 trillion in spending every year. 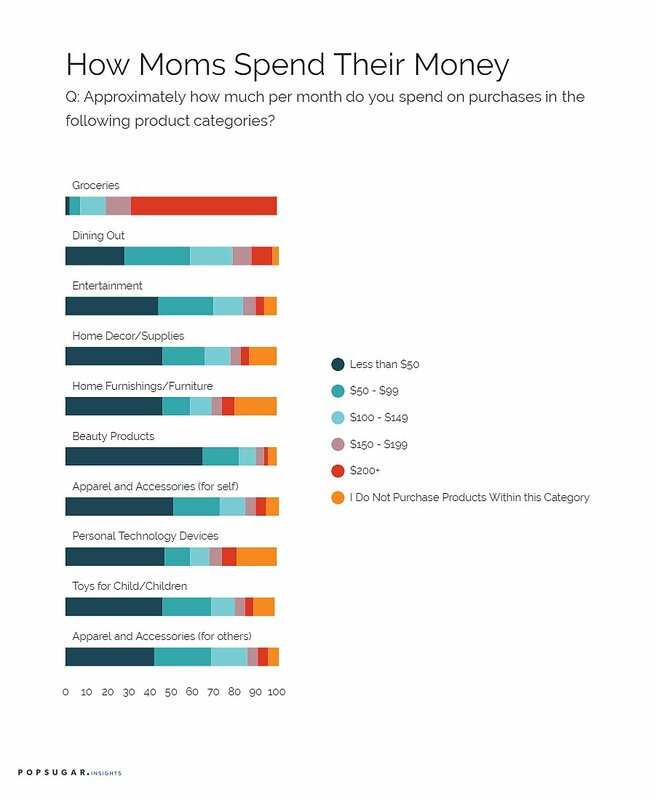 As part of the POPSUGAR Insights #Momstamina study, we wanted to find out what moms are spending their money on and how much influence kids have on those purchases. Feeding the family takes precedence over other activities and that's why moms are spending the most on groceries (69% spend $200+ a month) and dining out (70% spend $50-$200+ a month). Entertainment is an expenditure for some moms and not for others, as 50% spend $50-$200+ per month with the other 50% spending less than $50 or no money at all on entertainment. Moms are not concentrating on spending on home decor/supplies (59% spend less than $50 or none at all) or home furnishings (65% spend less than $50 or none at all). When it comes to personal purchases for themselves, moms are spending less on beauty (65% spend less than $50 a month) and apparel and accessories (68% spend less than $50-$99 a month). When it comes to spending on her family, she's spending a bit more: 52% spend $50-$200+ on apparel for others in the family. 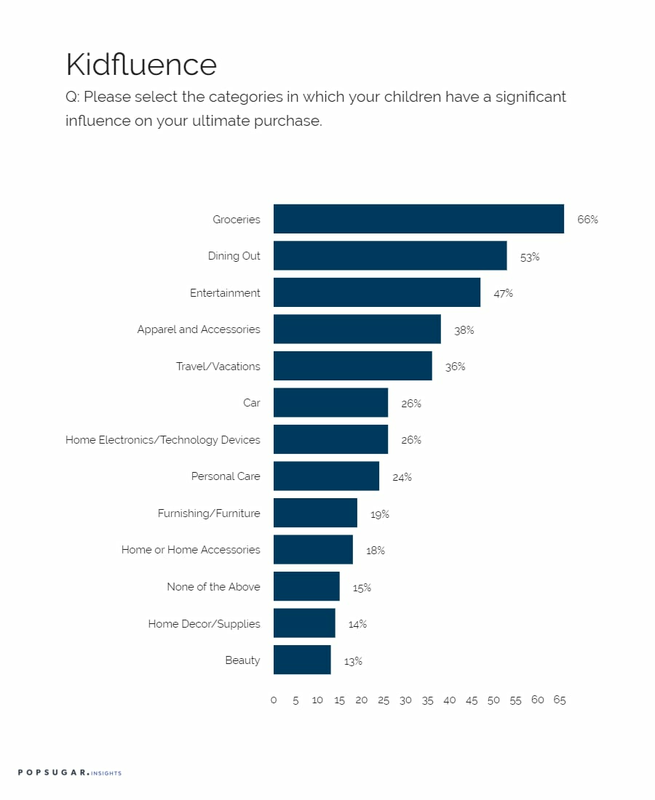 What influence do children have over their moms' purchases? It's fair to say that we've all witnessed examples of children pleading their case for a particular item in a grocery or other type of store, and if you're a parent, you've most likely experienced the influence kids can have over certain purchases first hand. It's interesting to note that the very items moms are spending the most on are the same ones that children have the most influence over; 66% of grocery purchases, 53% of dining-out choices, and 47% of entertainment selections. But kidfluence doesn't stop there, as they have a significant influence on apparel/accessories (38%), travel/vacations (36%), and car purchases (26%). The influence that children have on household purchases has evolved as children become more knowledgeable consumers. Moms are more open to their child's opinion about certain purchases, and are more inclusive when deciding on what to purchase. When dining with her child, she will solicit the opinion of her kids and decide on a family-friendly restaurant. When making travel plans she wants to ensure that her child will have fun experiences. For brands, it's important to consider that while moms are making the final decisions about which products are being purchased, their children have an important voice in the process, and have varying levels of "kidfluence" in the ultimate purchase decision.